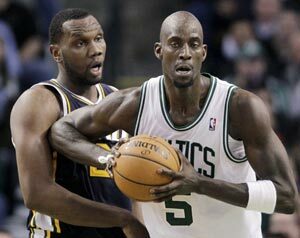 Kevin Garnett scored 23 points and added 10 rebounds to lead Boston to their fifth win in six games, downing Utah. Rajon Rondo had 14 assists for the Celtics, who moved into a tie with Philadelphia atop the Atlantic Division. Former Celtic Al Jefferson had 18 points and 12 rebounds for the Jazz.